AWK Programming Tutorial- Awk built-in variables FS, OFS, RS, ORS, NF, NR ~ Your Own Linux..! 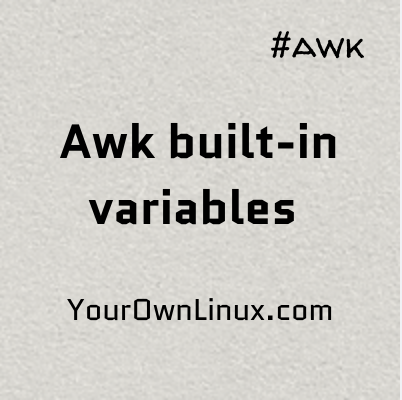 Awk built-in variables: This is the fourth article of this tutorial series on awk and in this one, we will be learning about built-in variables in awk. In case you have missed any of our previous articles, you can find them out here. 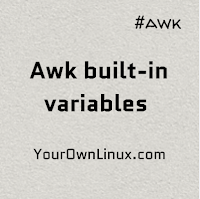 Awk comes up with a number of built-in variables. Of these variables, some have a default value associated with them which can be changed e.g. FS ( field separator, with default value of a whitespace ) and RS ( record separator, with default value of \n ). While, some variables are quite useful while doing analysis or creating reports e.g. NF ( number of fields ) and NR ( number of records ). Lets take a look at them one-by-one. With FS, we instruct awk that, in a particular input file, fields are separated by some character. Default value if this variable is a whitespace, telling awk that fields are separated by one or more whitespaces (including tabs). This default value can be overwritten with a character or a regular expression. For example, we can use a colon ( : ) to separate fields while working on /etc/passwd file. With OFS, we ask awk to use a particular character to separate the fields in the output. For this variable too, default value is a single whitespace. By default FS will use whitespace as a default value. Lets check extracting 1st and 3rd column without default value of FS. And now, using comma ( , ) as the field separator value. RS and ORS are useful while dealing with multi-line records. In this case, each field is on a new line. Default value of both these variables is a newline character ( \n ). With ORS value overwritten, we can tell awk to separate records with some other character then the newline. Lets take a look at our demo file wherein each record is separated by dual newlines ( \n\n ) and each field in the record is separated using single newline character ( \n ). P.O. Box 283 8562 Fusce Rd. Awk variable NF defines the number of fields if the current record ( $0 ). If we try to increase the value of NF, awk adds additional fields separated by the delimiter value in OFS. Whereas, when we decrease the value of NF, all the fields with identifiers greater than the value are ignored. NR is the variable that stores the current record number being processed by awk. There is another variable, FNR, which is useful while dealing with multiple files. It stores the position of the record relative to the current file only. Lets take a look at below demo file to illustrate this example. If you observe, it has different number of fields on each record. To illustrate the use of NR, we use the same file again. Its pretty straight forward. In case there are multiple files, we can print the record number relative to the current input file being processed using the variable FNR. 7 P.O. Box 283 8562 Fusce Rd. 17 Ap #867-859 Sit Rd. Observe the line after line #4. Awk has numbered it #1, just because we have used FNR. Had we used NR here, it would have been numbered #5. You can check this out, I will leave this for you. That's it for the scope of this article. Please share your feedback and suggestions in the comments section below and stay tuned for more articles. Thanks for reading.